A scuffle between two adult Laughing Gulls (Larus atricilla) on the beach on Assateague Island in Maryland. Because the first of this month happens to fall on a Thursday, I’ve picked a much older image to share in keeping with the #throwbackthursday trend on social media. Why not? 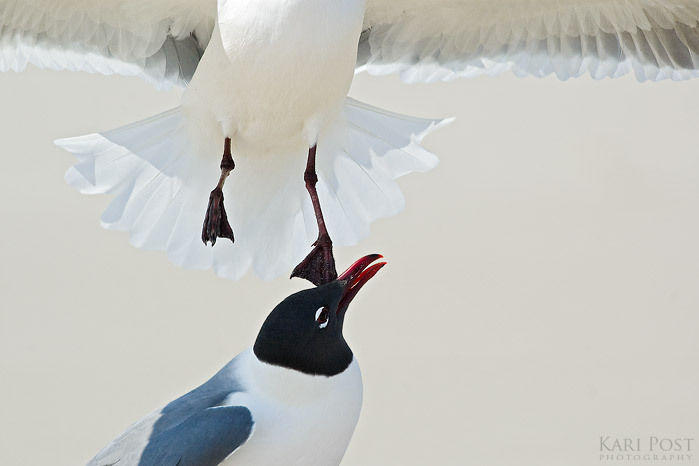 This photograph, of two laughing gulls in a bit of a squabble, was taken back in 2006 at the beginning of my nature photography career. I call it the beginning because although I had been taking pictures much longer and have loved animals, plants, and the outdoors my whole life, 2006 was when I started to focus my professional photography skills almost exclusively on subjects related to nature. That was the year I began dating another nature photographer, who I would end up spending the following three years learning from and traveling and shooting with, the year I bought a telephoto lens to enable me to photograph wildlife from a distance, and the year I bought a car, to give me freedom to explore wild places on my own. This was on one of my first outings with my new boyfriend and new lens. We drove to Assateague National Seashore because I had visited there once before and loved it, and Chris had never been even though he lived in northern Virginia, much closer to Assateague than I did in New Jersey. The laughing gulls were in full breeding plumage and being hysterical, as usual, so I crawled on my belly on the beach to snap shots of them as they pranced along ahead of the turquoise blue waves. I was enthralled with my new-to-me Sigma 500mm f/4.5 lens and happily took many photos, managing to capture this great interaction between two gulls as they squabbled over territory. This image stayed undisturbed on my hard drive for some time afterwards, until I one day discovered it and decided I really loved it. Now it’s one of my favorites. Photographed with a Nikon D70 and Sigma 500mm f/4.5 lens. REMEMBER: A 15% discount is available for all purchases of the Image of the Month during the month that it is featured only. If you would like to order prints or other products of this photograph, now is the time to do it. Just enter discount code IOTM at checkout. Posted in Image of the Month, Photography and tagged Image of the Month, larus atricilla, laughing gull, May 2014, photograph on May 1, 2014 May 9, 2014 by Kari. Spring is and has always been my favorite season. When I lived in New Jersey, signs of spring became readily apparent April. In between what always seemed like a lot of rain, this was the month during which flowers began blooming in abundance, the song of birds began to greet me awake in the morning, and warm weather made it possible to wear fewer layers while enjoying the outdoors. The warm temperatures, smell of wet earth, and signs of new life, from critters becoming active again and buds appearing for the first time in months, have always made spring my favorite. This time of year is always filled with such hope and promise it seems. I can’t help but think that my love for spring is somehow connected to my mom’s love of gardening. My mom has always maintained a fairly extensive flower garden, and all throughout college I made it a point to photograph her flowers at least a few times during the spring and summer months when they were in peak bloom and I was visiting home. In fact, mom’s flowers were the motivation for me to buy my first macro lens. Despite the hardships of trying to plant a beautiful organic garden in the suburbs of New Jersey (deer, rabbits, squirrels, and other critters enjoying making a meal of mom’s bulbs and buds), my mom keeps at it and I’m always amazed by the beauty of her little suburban oasis. Tulips are my favorite flower. I love their shape, from the voluptuous bell shaped flower itself to the angular arching leaves that frame the thick stem on either side. The year this photo was taken my mom planted 200 tulip bulbs in her garden, knowing I loved them so much, and deer ate all but two of them. This was one of the survivors. The yellow and pink glow in the background are the only others. Spring now is a little different that it was for me growing up. In New Hampshire, the approach of spring is a bit delayed and always preceded by mud season, which is pretty miserable. Here, the season is shorter, and aside from that, I’ve never actually spent a spring in New Hampshire. Ever since relocating several years ago, I have traveled for much of the spring season, spending a portion of April in Florida each year for the Birding and Photo Fest in St. Augustine, and heading down to Baltimore and West Virginia in May to lead a backpacking trip for Johns Hopkins University. 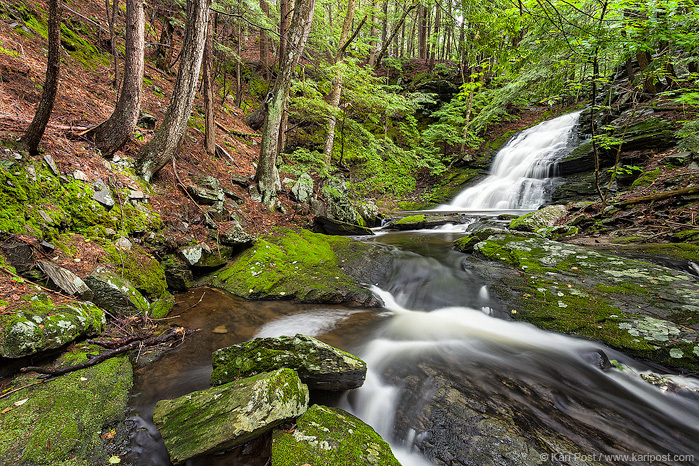 This will be the first year since I’ve moved here that I will be able to experience a New Hampshire spring, departing for only two weeks at the end of May for the backpacking trip. Even though I anticipate it will be far less spectacular than those down south, where azaleas, rhododendrons, Eastern redbud, and numerous other flowers appear in abundance, I’m excited to be able to have time to enjoy the season at home, mud and all. REMEMBER: A 15% discount is available for all purchases of the Image of the Month during the month that it is featured only. 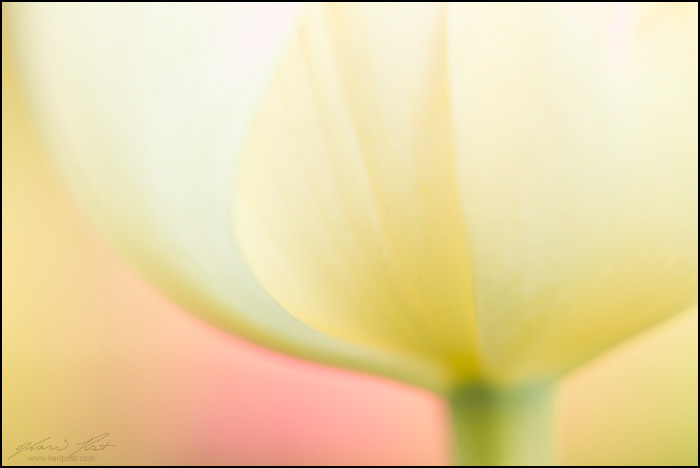 If you would like to order prints or other products of “Tulip Abstract” now is the time to do it! Posted in Image of the Month, Photography and tagged April, flowers, garden, New Hampshire, New Jersey, Photo of the Month, spring, tulip on April 2, 2014 April 2, 2014 by Kari. I’m going to start to try to do some regular features on my blog and social media. I have a few ideas of things I would like to focus on, but I’ve decided to start with an Image of the Month feature. Every month I will select an image taken during that month at some point in a previous calendar year and display it on my website and blog as the featured image along with a little blurb about it. The blurb may be a photo tip, the story behind the image, or other interesting info related to the selected photo, and will hopefully be educational, inspiring, or ideally a mix of both. In addition, I will offer a 15% discount on prints and products of that photo for the month it is featured only! So hopefully, the Image of the Month feature ends up being a great way to give readers something to look forward to on my blog each month, and maybe learn a thing or two while saving on prints as well! The first photo I’m selecting for this new feature is one of a Northern Gannet in flight, taken on March 23, 2008. This photograph illustrates how understanding animal behavior – and networking with other photographers – can yield great photo opportunities. Gannets are pelagic birds who live most of their lives at sea. They feed on marine fish by plunge diving from high overhead, tucking their wings into their bodies and shooting like torpedoes through the air and deep under the water’s surface to catch prey. One such fish they enjoy is green herring, and in March off the Atlantic coast of the United States, herring congregate to spawn. During this migration, gannets are attracted to the schools of fish by the hundreds. I used to live in New Jersey, and the Cape May-Lewes ferry provides car and passenger service across the Delaware Bay from Cape May, NJ to Lewes, DE. During March of 2008, thousands of herring appeared in the waters of the bay during their migration, attracting the gannets. As the ferry made its regular commute back and forth the boat’s motor would stun and churn up the fish, making them easy targets for gannets, gulls, and other birds. Some photographer friends gave me a heads up that this was happening, so my photographer boyfriend at the time and I decided to go and ride the ferry with them to photograph the gannets. We arrived early in the morning for the first ferry, carrying all of our camera gear, and ended up riding the ferry all day, photographing the birds. Fortunately days in March are still fairly short, and the sun doesn’t rise or set too quickly. At the end of the day, our last round trip yielded some beautiful light, with the sun low in the sky and casting a warm golden glow on the activity, pretty clouds, and cooperative birds. Most of my best shots from the day were in this last pass. In this shot, I managed to get lucky, and captured an adult gannet with it’s wing spread right in front of a cloud that perfectly mimicked the wing shape. There is no photoshop here, and I was fortunate that no other birds ended up in the background of this shot. To get the composition right, the photograph did require a small crop, but I still am quite happy with the end result. Techs: Canon 1D Mark II N, Canon 70-200mm f/4L IS lens, 1/2000s, f/6.3, ISO 500, handheld, cropped. 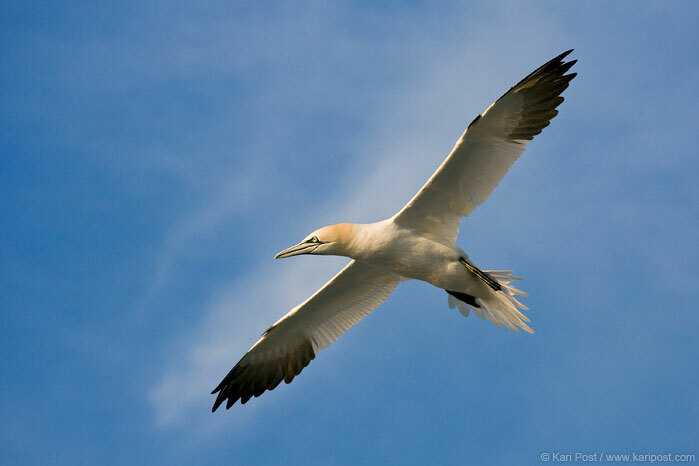 Posted in Image of the Month, Photography and tagged Delaware Bay, Image of the Month, IOTM, March 2014, Northern Gannet on March 1, 2014 March 1, 2014 by Kari.